Sound is continuously present in the underwater environment, and is produced naturally for example by wind, waves, ice, and thunder storms, as well as by animals. Human activities cause additional sounds which may have a polluting effect. 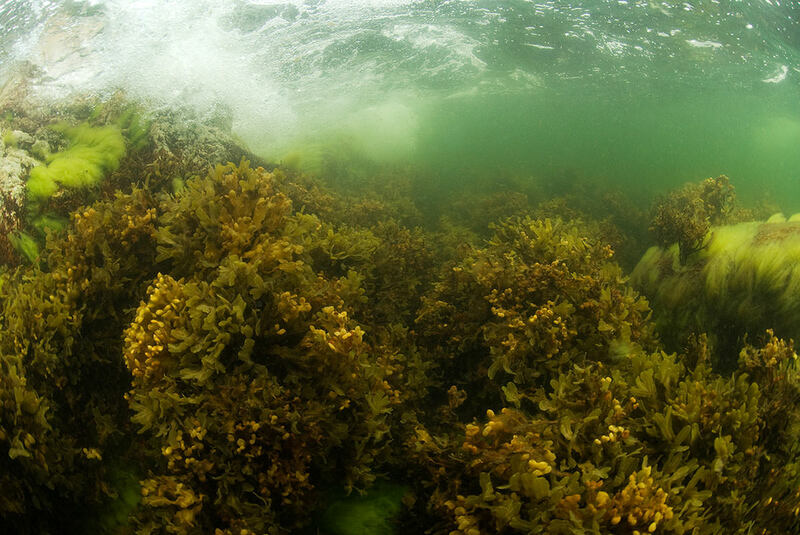 Underwater sound is caused by various human activities in the Baltic Sea. The highest levels of continuous sound are seen close to key shipping lanes. impulsive sound events were registered in 2011–2016, mainly stemming from explosions. Sound is continuously present in the underwater environment, and is produced naturally for example by wind, waves, ice, and thunder storms, as well as by animals. Human activities cause additional sounds which may have a polluting effect. These are typically by-products of marine activities and infrastructure, such as shipping, bridges, or underwater construction work, but are also spread deliberately by the use of echo-sounders, sonars and seismic airguns, for example. 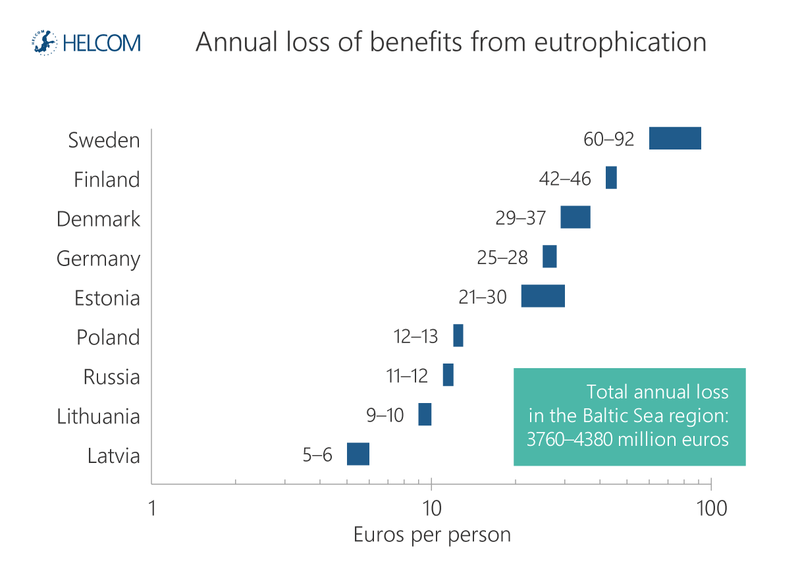 HELCOM has developed monitoring of underwater sound, and agreed that underwater sound should not have negative impact on marine life in the Baltic Sea. Sound waves propagate over long ranges in water and their impact may occur far from the sources, across national boundaries. Two categories of sound are identified: continuous and impulsive. Continuous sound from a source can be constant, fluctuating, or slowly varying over a long time interval. Various human activities may generate continuous sound. 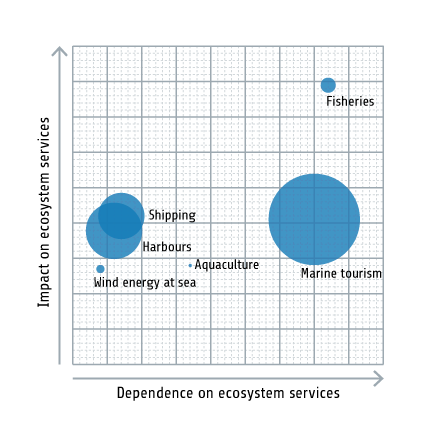 Examples of activities which influence the local sound environment include bridges, offshore wind turbines, shipping and boating. One concern is that human generated continuous sound may mask animals’ communication and signals used for orientation. Impulsive sound is characterised by short duration and a fast pulse rise time. The sound associated with piling, underwater explosions or airgun signals used in seismic surveying are examples of impulsive sound. This type of sound can displace animals, and scare them away from significant areas for feeding, calving and other social interactions, as well as cause temporary or permanent hearing loss if no mitigation measures are applied. There is a variation in how well animals hear different frequencies, and therefore different species will perceive different parts of the soundscape in different ways. For example, fish hear low frequencies better than marine mammals, and porpoises hear higher frequencies better than seals. 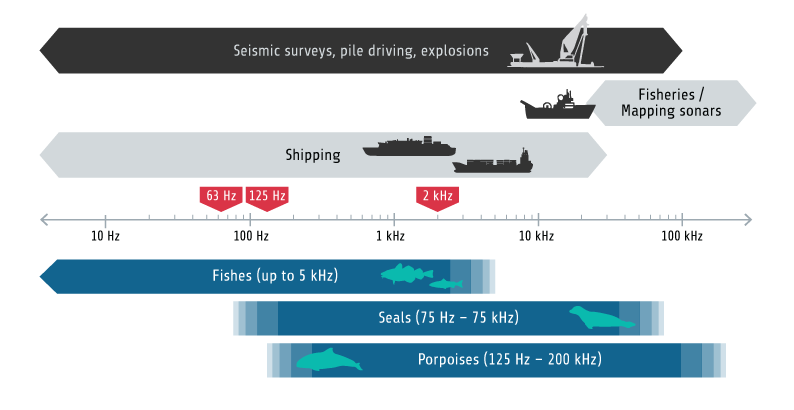 The sound produced from shipping occur at frequencies which overlap with the hearing range of several species, including fish and marine mammals (Figure 4.4.1). 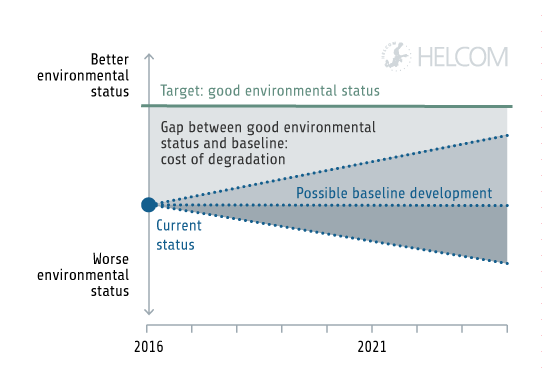 A good environmental status with respect to underwater sound requires that the level and distribution of both continuous and impulsive sounds should not cause negative impacts on marine life (HELCOM 2013a). 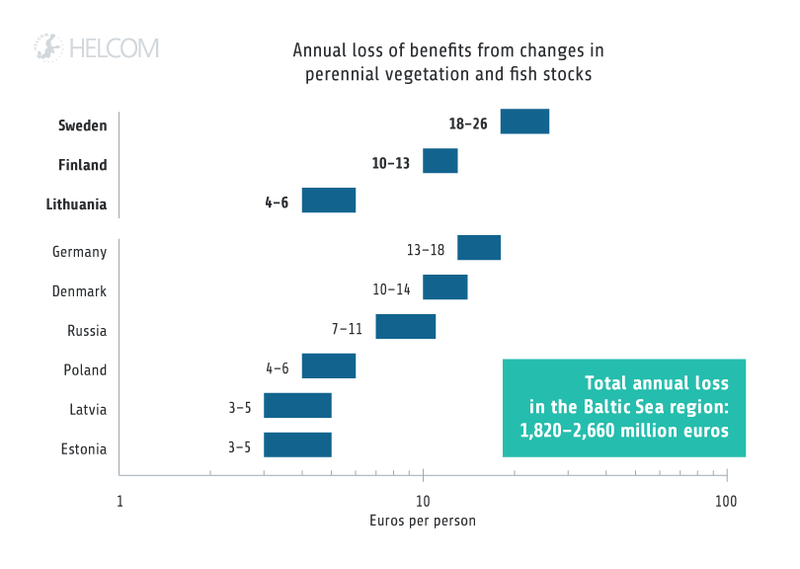 At this time, such levels have not been defined for sound sensitive species in the Baltic Sea. 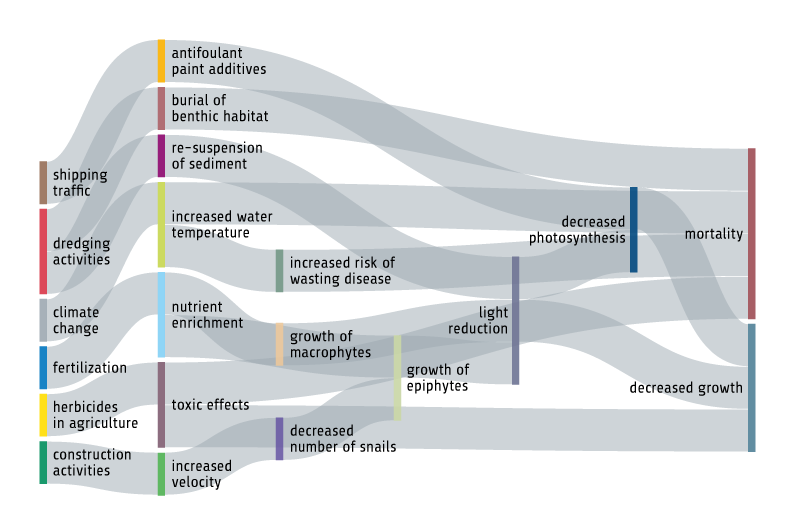 Figure 4.4.1. Sound frequencies generated by human activities with schematic illustration of auditory range of some marine species present in the Baltic Sea. Both impulsive sound (black bar) and continuous sound (grey bars) are present in the Baltic Sea and can be perceived by for example fish, seals and harbour porpoise at a wide range of frequencies. The frequencies of sound from human activities are indicated broadly, and are highly variable also within the same activity type. For example, sound from pile driving is typically most intense at frequency ranges up to 1kHz, but is also heard at higher frequencies, and the intensity and character of the sound varies depending on several factors, such as which specific method is used and seabed characteristics in the area where the activity takes place. 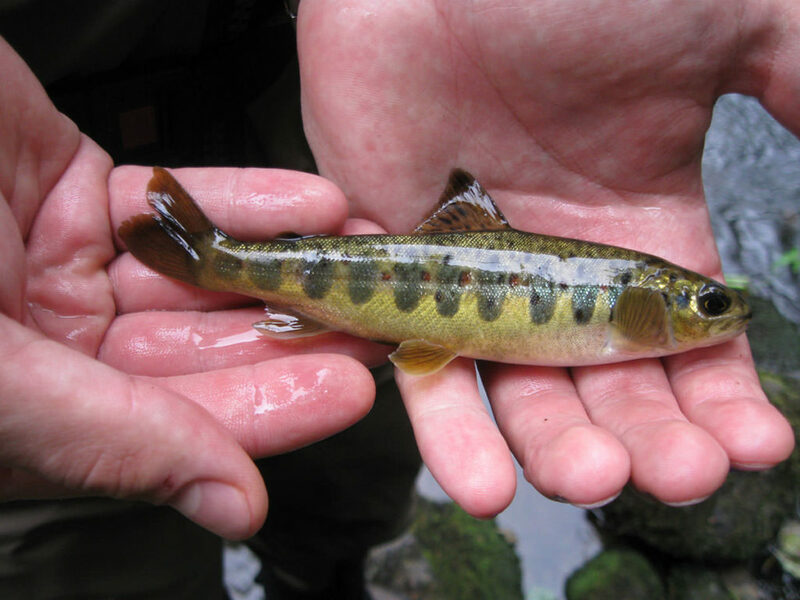 Fish typically hear sound at lower frequency ranges and harbour porpoises at higher frequency ranges. For comparison, the human ear can hear frequencies only at a range in from around 20 Hz to 20 kHz in air. However, the sound pressure levels and distribution of sound under water is not directly comparable to those in air. The red arrows point to the frequency bands monitored within BIAS (see figure 4.4.2). Modified from Scholik-Schlomer (2015) and BIAS (2017). 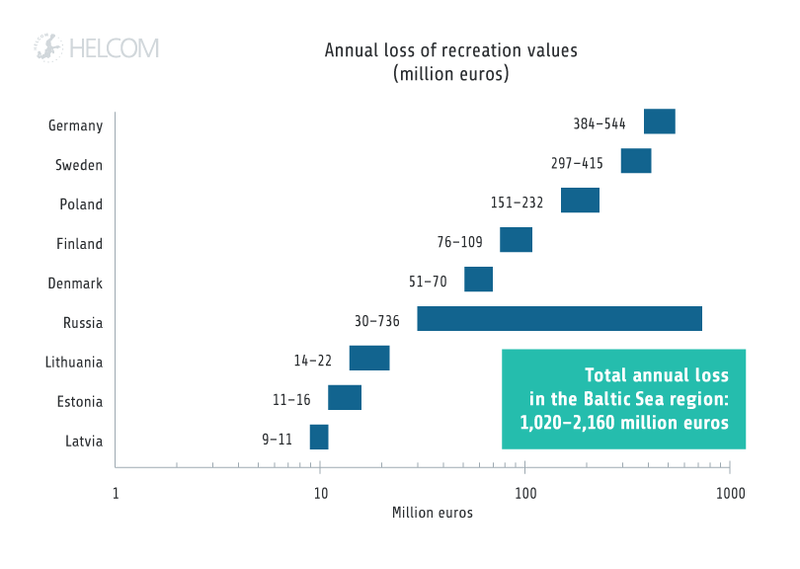 Continuous sound in the Baltic Sea was monitored in a comprehensive study using automated hydrophone loggers in 2014 by the project Baltic Sea Information on the Acoustic Soundscape (BIAS). The data were used to develop modelled soundscape maps (Figure 4.4.2), which show the spatial and temporal distribution of continuous sound in different frequency bands across the Baltic Sea (1/3 octave bands of 63, 125 and 2000 Hz). The lower frequency bands assessed are mostly related to ship induced sound, and the higher frequency bands are measured due to their ecological relevance. Areas with high sound levels are identified particularly along major shipping routes, and within these, the highest prevalence is seen in the southernmost areas. Monitoring of ambient sound is carried out by several countries on a temporary basis, and a regional programme for monitoring continuous underwater sound is under development. 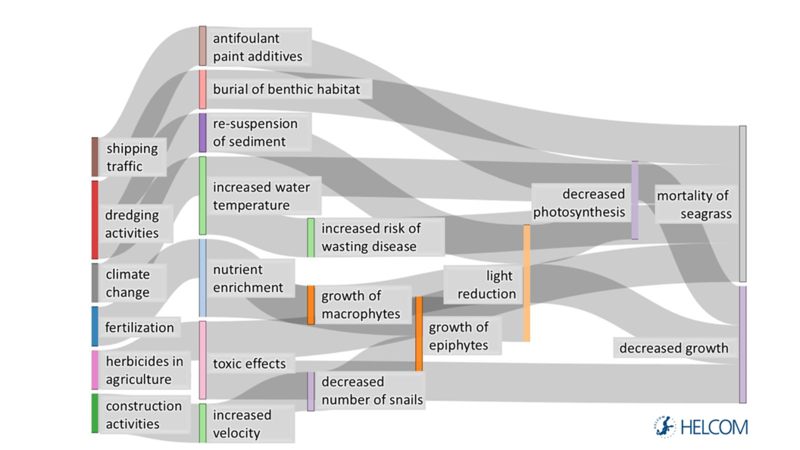 Figure 4.4.2. Sections of the Baltic Sea soundscape. The maps show the sound pressure level of underwater continuous sound at different frequency bands (measured as dB re 1µPa in 1/3 octave frequency bands centred at 63 Hz, 125 Hz and 2000 Hz, respectively). In each case, the upper row shows the distribution of sound pressure levels exceeded 5% of the time (L5), and the lower row the levels exceeded at least half of the time (L50). For example, areas experiencing sound pressures above 100 dB re 1µPa during more than half of the time are confined to the narrow parts of the main shipping route. A considerably larger area experiences similar sound pressure level 5% of the time. The values represent the whole depth layer from surface to bottom as annual averages for 2014. The results have been extracted with help of the soundscape planning tool of BIAS (2016). Impulsive sounds may cause displacement as well as physical damage to marine animals, unless mitigation measures are successfully applied. The occurrence of activities associated with loud impulsive sounds, such as hydro-acoustic measurements, underwater explosions and pile driving, can (since 2015) be logged in a regional registry established by HELCOM and OSPAR and hosted by ICES (2018). Countries have agreed to register these activities, and reports on sound-generating activities have so far been supplied by six countries during the period 2011–2016 (Table 4.4.1). 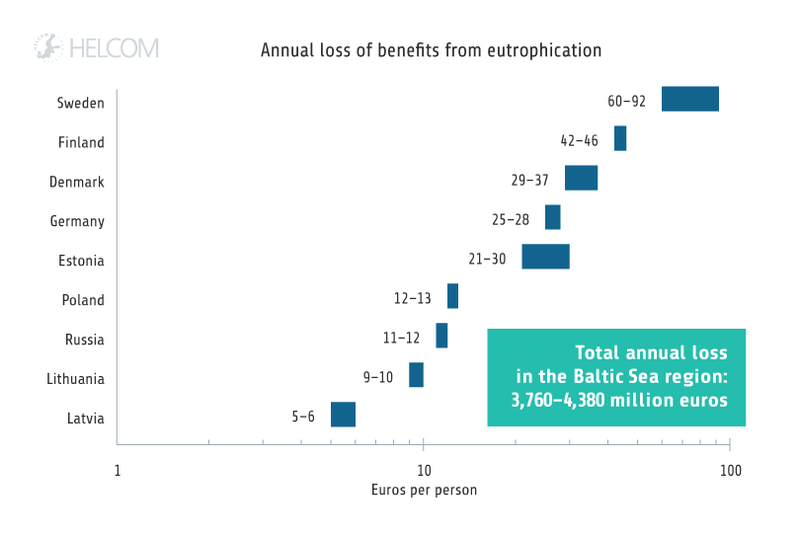 In the future the registry will provide a quantitative view of activities that generate impulsive sound and their distribution in the Baltic Sea to support future status assessments. 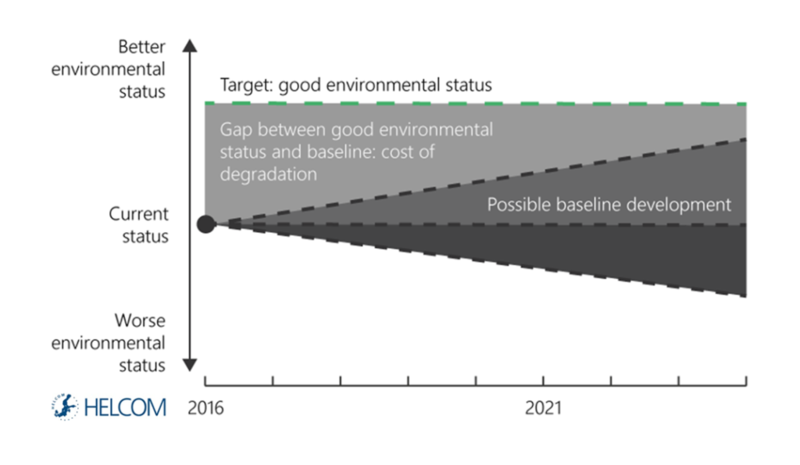 Information from the registry will also support evaluation of possible impacts on species and decisions on mitigation strategies to be applied when conducting impulsive sound generating activities. Table 4.4.1. 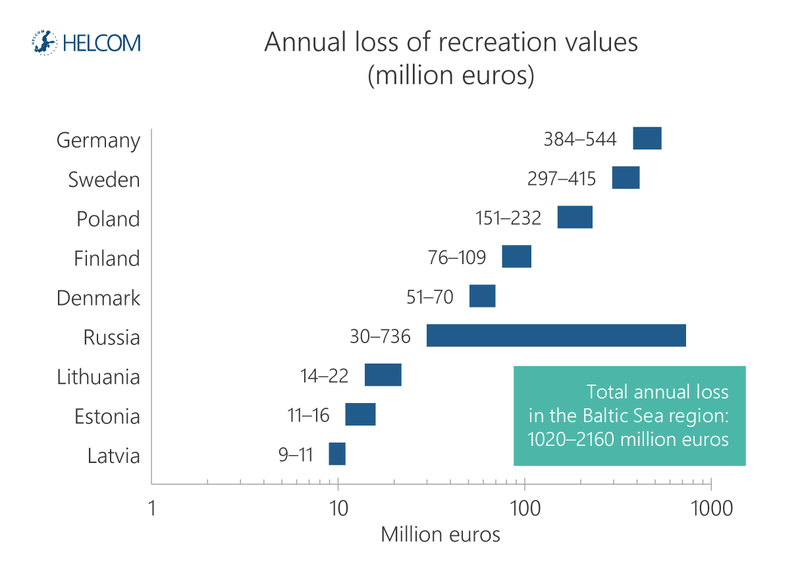 Impulsive event days in the Baltic Sea reported by HELCOM countries, given by event type as reported to the regional registry of impulsive events, by April 2018 (ICES 2018). Values show reported numbers of annual events for the years 2011-2016. Reporting is limited to events meeting predefined criteria relating to pressure categories, and is currently under development. The numbers give an indication of the occurrence of impulsive events, but some events taking place are absent from national registers. ‘NR’ is shown for cases of no reporting/not known. Note that pile driving activities included in the table often use mitigation measures which reduce the impulsive sound. 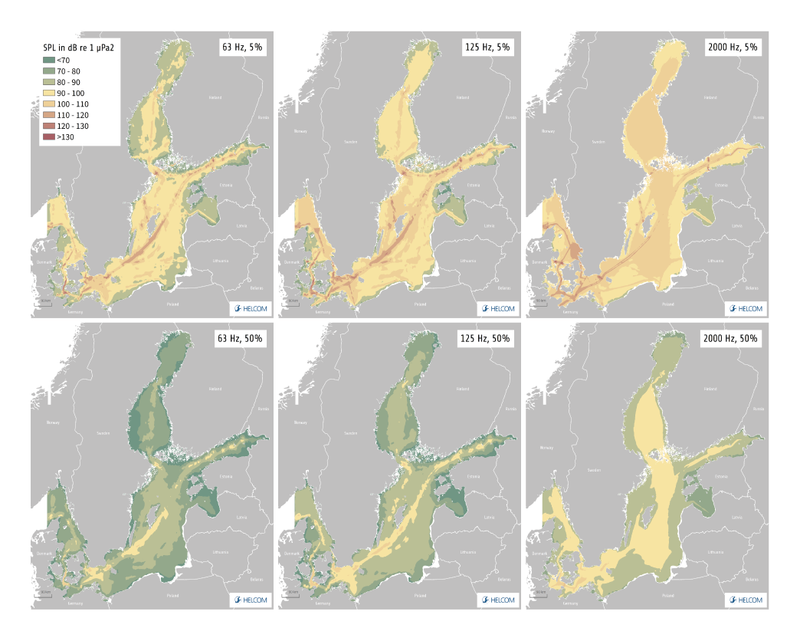 Across the Baltic Sea there is strong temporal and spatial variability in sound levels, but there is still considerable uncertainty regarding to what extent marine species may be impacted. Harbour porpoise and seals are likely to be especially affected by human generated sound of specific frequencies and levels (Kastelein et al., 20110). They have very good underwater hearing abilities and rely on sound for their orientation, communication and foraging. Harbour porpoise also uses echolocation to find prey. Many Baltic fish species hear and produce sound at low frequencies. For example cod uses sound to communicate and to perceive their environment. For most species, including fish, diving birds and the majority of Baltic invertebrates, little is known about what role sound plays, even though it is likely that it is essential in at least some part of their life cycle and that they could be affected by high sound levels. 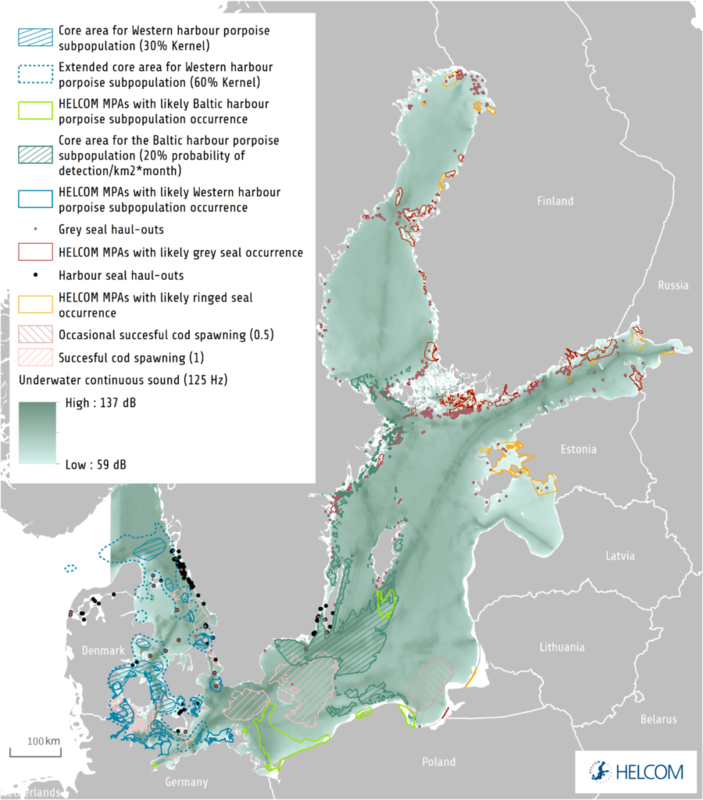 For the first time in the HELCOM assessment, spatial information of the sound distribution in the Baltic Sea has been compared with maps of key areas for sound-sensitive species. 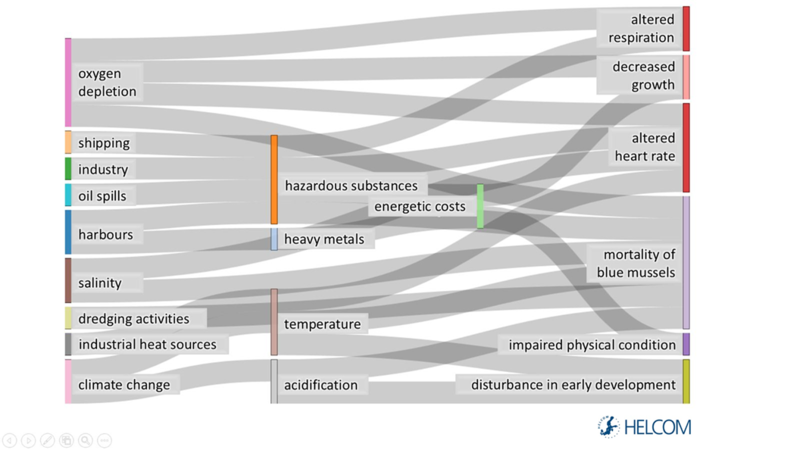 The overlap (Figure 4.4.3) gives indication of the risks from sound generating activities to different species. Spawning areas for cod and recruitment and foraging areas for harbour porpoise are examples of areas with elevated risk of impact. 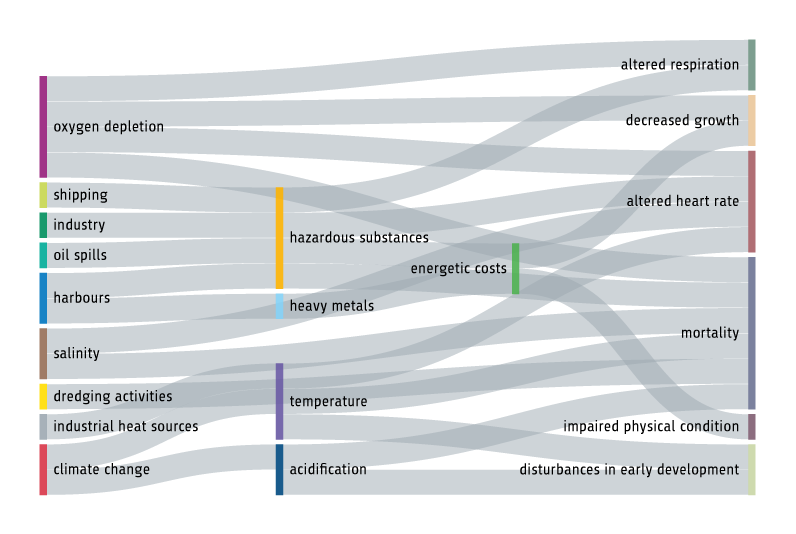 Figure 4.4.3. Example of how information on the distribution of sound can be compared with important areas for species that are sensitive to sound. The example shows areas identified so far, based on Schack et al. (2016, see HELCOM 2016c). The soundscape shown is the sound pressure level (dB re 1uPa) for the 125 Hz frequency band occurring 5% of the time, for the whole water column (surface to bottom) in June 2014. 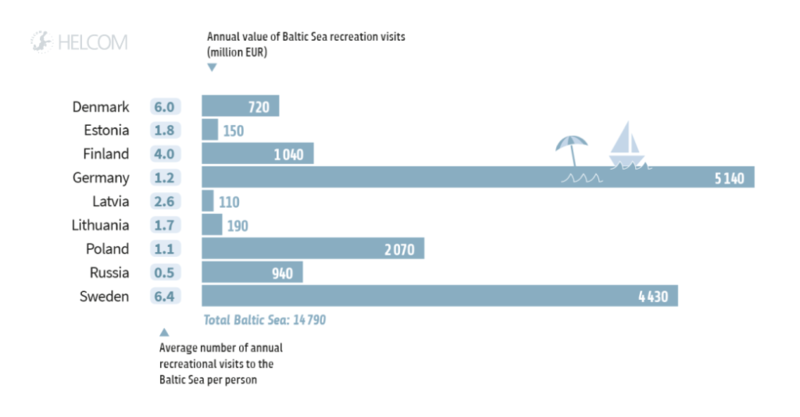 There is no data to show how sound levels have changed over time in the Baltic Sea. Looking ahead, at least some of the human activities which may generate underwater sound are likely to increase, such as off-shore construction work, energy installations and shipping, as well as dredging and leisure boating. Depending on the scale of such expansions, as well as technical developments in maritime activities, it is likely that both the level of sound and its character will change over time. There is still limited knowledge about how marine animals may react to or be affected by human induced underwater sound. 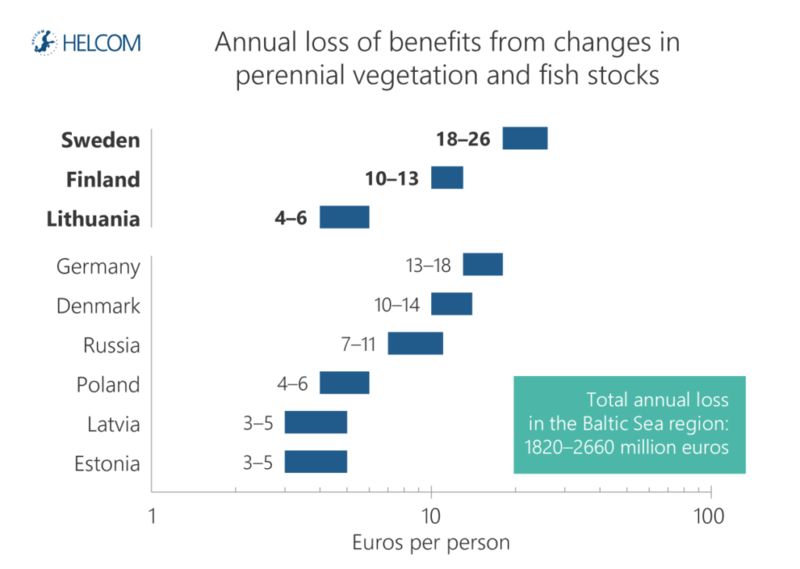 With respect to areas, species and seasons involving high risks, pre-emptive mitigation measures and the implementation of sound reduction solutions are foreseen to play an important role in counteracting and reducing impacts, as well as maritime spatial planning.